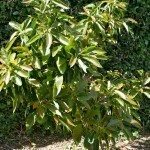 Can you help diagnosing avocado tree problem? It is over 30 yrs old Pictures include area at base of tree, leaves, current size of fruit,etc. I have also included some other pics of tree taken in the last 5 yrs as a comparison.